No matter what degree black belt of feline translator you may be, one question will always elude answer: Why do cats purr? If you’ve ever been the proud parent of a feline, it’s a good bet you’ve found a way to decode, at least in part, their mysterious language. From the soft mewls that greet you when you walk through the door (“Where’d you go? !”) to the persistent chatter that comes, like clockwork, at sundown (“Feed me. Now.“), their odd utterances start to make a certain kind of sense. But no matter what degree black belt of feline translator you may be, one question eludes answer: Why do cats purr? Believe it or not, your cat’s purrs make him or her incredibly unique, as far as felines go. Purring is a unique feature that the average house cat shares with only a few other members of the felidae animal family, including the bobcat, the cheetah, the puma, the wildcat, and the Eurasian Lynx. This means that larger cats—lions, tigers, leopards, and panthers—don’t purr. 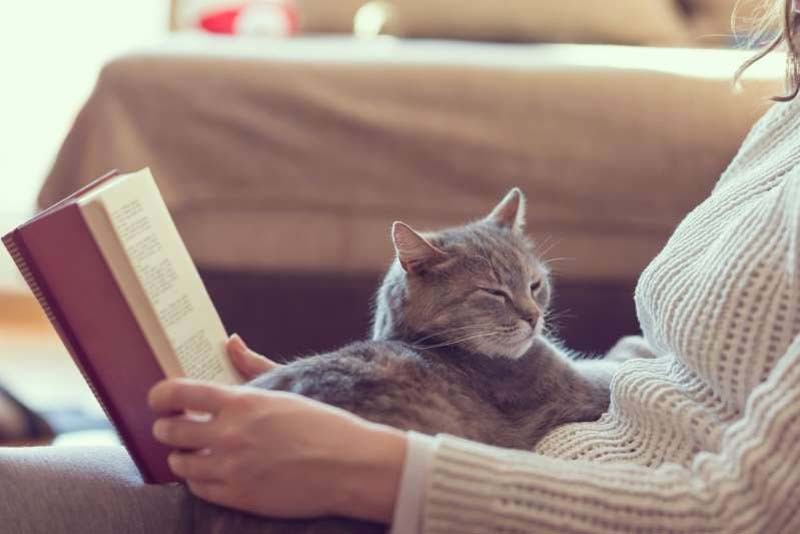 According to the Library of Congress, the purring sounds that your cat makes is caused by the intrinsic (internal) laryngeal muscles that open the glottis—the space between the vocal cords—resulting in a separation of the vocal cords, which is ultimately how the purr sound is created. This entire act is said to be stimulated by the neural oscillator, located in the cat’s brain. As far as why cats purr, the answer is often quite simple: they’re happy. (Or, at the very least, content.) In fact, according to the veterinary experts at Doctors Foster and Smith, at the beginning of a cat’s life, purring serves as a crucial communicator between a mother cat and her litter of kittens; a purr indicates to the mother cat that “all is well.” This is especially common during the nursing process, when kittens can’t nurse and meow at the same time, creating the need for a purr, an action that can affirm contentedness without requiring the kitten to stop nursing. Okay, then why do cats purr when they grow up? According to the Library of Congress, purring is also a “natural healing mechanism,” as the purrs emitted by the cat actually produce low-frequency vibrations that have been linked to the “strengthening and repairing of bones, relief of pain, and wound healing.” Additionally, purring can also be a call of distress—maybe they need the litter box changed, or water bowl filled—so be sure that you’re keeping a keen eye out if a cat is acting uncharacteristically affectionate. On a happier note, purring can also be an indicator that an older cat wants to play, according to Doctors Foster and Smith: “Older cats purr when they play or approach other cats, signaling they are friendly and want to come closer.” Stranger cats? Friendly with each other? Yeah—we’ll believe that when we see it. And for more on your favorite felines, know that This Is Why Cats Are Terrified of Cucumbers.